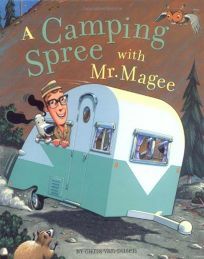 Readers who enjoyed their trip Down to the Sea with Mr. Magee will look forward to A Camping Spree with Mr. Magee by Chris Van Dusen. Mr. Magee and his dog Dee are in for another unexpectedly wild ride, this time thanks to a hungry old bear, who manages to unhitch their camper and leave them stuck on a rock ""On top of the waterfall, fifty feet up!"" The ebullient rhyming text and nostalgic 1950's-era gouaches bounce along with a lively comic momentum. .